As a permanent source of community capital, the Community Foundation is here to promote positive change and a better quality of life for all residents. In favorable times and challenging ones, our mission remains the same: to promote community philanthropy in the seven counties of southeast Michigan and to invest in programs that make life better for all our citizens. During our 33-year history, the Community Foundation has shown remarkable growth, thanks to the support of thousands of donors. Last year, we distributed more than $73 million to promising programs and effective nonprofit organizations. Our grants address a broad range of programs across the region brought to us by hard-working organizations. We are pleased to support their efforts. The Community Foundation also achieves impact through grants focused on specific issues. 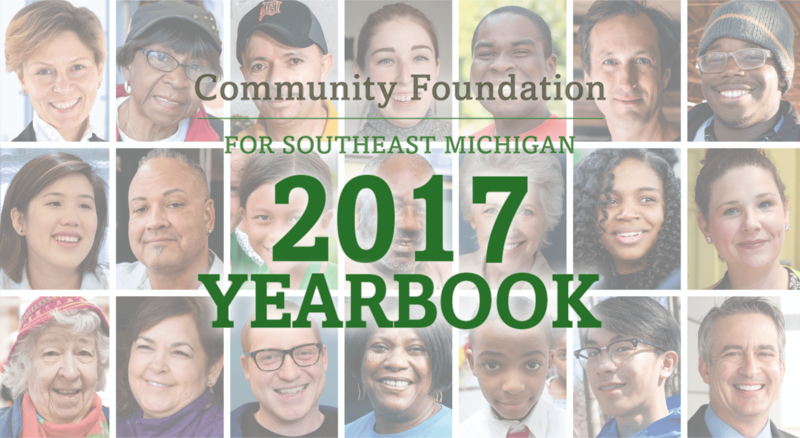 In the 2017 Yearbook, you will read about three of our issue areas: economic vitality, healthy communities, and investing in youth. Although these areas are not the sole focus of our grantmaking, the stories in this yearbook illustrate organizations that strive to create positive change and address emerging opportunities within the region.